Gold is an important topic to have some knowledge of if you are interested in prepping, survivalism and off-grid related topics. If the grid goes down and electronic fund transfers cease, or if there is a run on the banks, then gold will be of paramount importance. Gold is still regarded as the most tangible, reliable and durable form of wealth in the world. There are many tests for gold and quite a few of them eliminate some but not all fakes: What is needed is a comprehensive resource and, depending on the circumstances, more than one type of test will be required. So with this page, we have attempted to build the “mother ship” – a giant list of all the possible ways to tell if gold is real, together with descriptions of their limitations. Bookmark this page and keep it as a reference for the future! Of all the subjects one can possibly research online, the subject of how to tell if gold is real must rank as one of those highest in either misinformation or partial truth. To illustrate the misinformation and folly that is out there – I have even read one statement that if gold jewelry sinks in a bucket of water, it must be real! This is very obviously false – almost all metals are heavier than water. Important note – if you are examining gold of considerable value, the best way of all to ascertain whether it is real is to take it to a reputable professional jeweler, bullion dealer or antiques dealer, or to contact an assay office (most countries have these). A good jeweler / antiques expert will have the training and the “lookup charts” to decode accurately hallmarks on jewelry. Also a reputable jeweler will have testing kits to evaluate gold and of course the expertise to test it without causing damage. A jeweler may of course charge a fee for this service. For “serious” scenarios, contact an assay office. This is an institution specifically set up to test the purity of precious metals. It is only assay offices that are legally permitted to apply hallmarks to gold, platinum or silver items, guaranteeing their purity. As assay offices may be considered the greatest masters of evaluating gold, it is instructive to observe their methods, as these will be the ones of greatest accuracy. We will also look at simpler methods which may be applied at home, with consideration of their accuracy and usefulness. The first thing to note is that some methods of evaluating gold are more destructive than others: If one has a piece of fine jewelry, one wants to use the least destructive method possible; whereas if one has raw metal, this factor is not quite as important. Source: First, gold bullion bars will very often (but not always) come with an assay certificate guaranteeing their purity. It is also recommended to buy gold bullion of one of the well known brands (typically major banks or well known mints), through an established bullion dealer. If you are buying a valuable gold coin, inquire about the provenance. This is the history of where the coin was originally purchased or discovered. If it comes with authentication such as proof of purchase through a major auction house or coin dealer, that is very beneficial. Weight: Although not an absolute test, solid gold is heavy. (It has a specific gravity of around 19.2). A gold plated copper, iron, brass or silver item will simply not have the same weighty feel to it. However lead and tungsten are both heavy metals and there have been (very rare) reports of gold bars being hollowed out and filled with one of these cheaper metals. 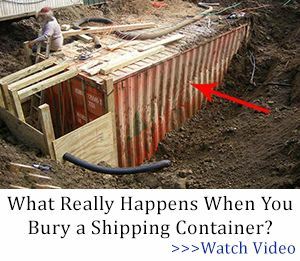 Typically, if you have purchased through a reputable dealer this will almost certainly not happen, and you will have a warranty. Age means nothing: Remember that in the world of coins, forgery is a very ancient art, once considered such a serious matter that it was actually punishable by death in the old days – yet it still went on. So the fact that a coin is, or appears to be, very old, does not in itself guarantee that it is genuine. Price: Apply the obvious maxim that if something seems too good to be true, it probably is. Watch out for fake coins on ebay. These can be purchased on the open market from aliexpress.com – a good tip is to go to aliexpress and look at the fake coins that are for sale. You can then easily recognize that these are the fakes that come up on ebay; often they will use the exact same photo because they may even have the item sent directly from China, pocketing the difference in price. Let’s move on. The hallmark indicates that the item has been assayed. It is highly illegal to falsify a hallmark and penalties are severe. Fraudulent hallmarks are uncommon but technically a possibility so additional tests may be advisable in doubtful cases. Hallmarks can be compared to hallmark charts (which can be found online) and they will give much information about the age of the item and its origins. Examine any hallmarks and other mint marks closely, with a magnifying glass or jeweler’s loupe (Amazon Link) if possible. A genuine hallmark will have a professional appearance – evenly stamped and detailed, whereas a fake mark made from a cast will appear untidy and lack detail. Millesimal fineness marks: Not all precious metal items will have hallmarks. In addition to / instead of hallmarks, you may see a millesimal fineness mark. This will be a small (or even tiny, depending on the size of the item) stamp of a three-figure number, which denotes the purity in terms of “parts out of one thousand” of pure metal. Thus a millesimal fineness mark of 833 indicates the metal was 0.833 pure. To obtain the “carat” figure, multiply this number by 24. So 0.833 x 24 = 20 carat. Unlike hallmarks, which may only be applied legally by a governing body, a millesimal fineness mark may legally be applied by the maker of the item and should be used strictly to denote the purity of metal used in its manufacture; though it is ultimately possible that this mark is fraudulent, therefore it is not an absolute guarantee of purity. It is useful, but other tests should still be applied. Interestingly, the numbers applied to gold, silver and platinum are typically different. The numbers 375, 585, 750, 833 or 917 denote that the item is indicated to be gold, at purity denoted by the number. 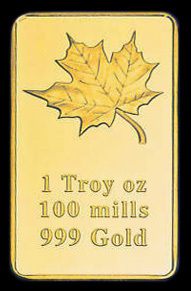 You will also see gold bullion bars at 999, 999.9 or similar (more on this below). Silver items (which were perhaps later gold plated in an attempt to pass them off as gold), may be marked with 800, 830, 835, 875 or 925. Note that if the item is marked “sterling” or 925, it is almost certainly sterling silver that has been gold plated. Note also 958, which was a number applied to Britannia silver. And finally 950; typically applied to platinum. It’s very unlikely that you would see platinum plated in gold and passed off as such, due to the fact that platinum is almost as expensive as gold. “Milled” coins minted in the modern era (since coin milling began in the 17th century) were of very precise weight, which can be ascertained by weighing. Note that if a coin is worn from circulation, the weight will be very slightly less than that of the uncirculated coin. Official coin weights can be obtained from coin collector catalogues and this is a simple test – if the weight is way off, then the coin is certainly fake. That does not necessarily mean that if it has the correct weight, it is genuine. But weight will weed out the majority of fakes, especially of gold and silver coins which are faked using cheap metals. Precision scales can be obtained for very reasonable cost these days. Here is a 50g x 0.001g scale (weighs up to 50 grams at precision of 0.001 gram, which is more than sufficient for coin weighing!) I bought on Amazon for under $20 – and found to be very accurate. It comes with a 50-gram weight so that its precision can be tested prior to use. It is advisable also to obtain a very accurate set of precision weights so that these can be used to test scales at different weights on an ongoing basis. banknotes – enabling duplicate bars to be detected as there should only be one bar of that type with any given serial number in existence! 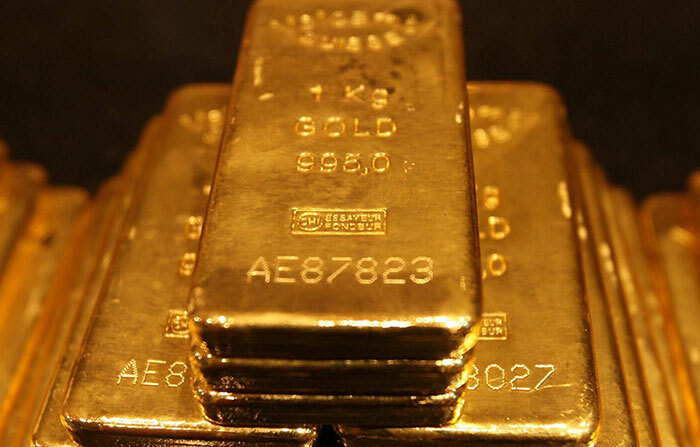 It is advised to purchase and sell gold bullion bars through accredited bullion dealers, who will provide guarantees. Gold bullion bar purity will be denoted with a numerical stamp. Often seen will be 999 – “three nines fine” – which means the item is 99.9% pure gold. You may also see 999.9 (higher purity, 99.99% pure gold). You may also see 995,0 as in the example above, which means of course that the bar is 99.5% pure gold. Note however that if it is marked 1 Kg GOLD then it should legally contain exactly one kilogram of gold, regardless of the purity – meaning that the actual weight of the bar on the scales may be slightly higher. So for bullion purposes, the weight of gold that is denoted on the bar is the critical factor and the purity is somewhat irrelevant. Depending on their country of origin, gold bar weights will be denoted in various systems including metric and imperial. The famous “chocolate bar shaped” gold bars (above) you see in bank vaults and movie heists are what is known as “good delivery bars”. These are a global standard size used in international money transfers and are 400oz (25 pounds) in weight. They are still a preferred and highly trusted form of wealth utilized by banks and governments. 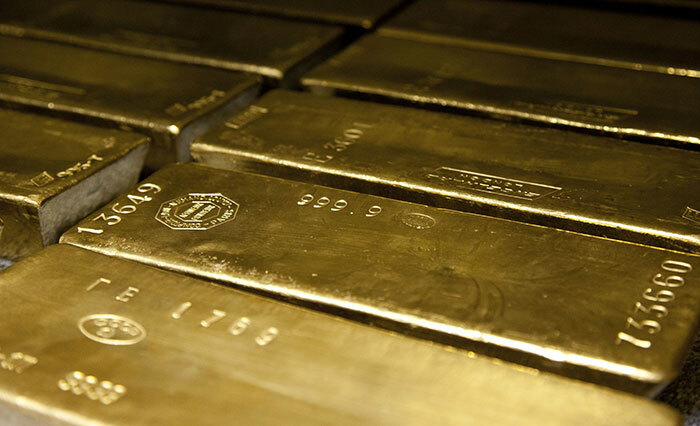 When you hear about a nation’s gold reserves, it will typically be in the form of these bars. It’s strange to think that these most tangible and real representations of worldly wealth have never been seen or touched by most people and spend most of their lives in the dark, in high security vaults. Note that the ounces denoted in bullion weights are troy ounces and it is important to know that there is a difference between a “troy ounce” and an ordinary or “avoirdupois ounce” – otherwise you will miscalculate the weight of your gold bar. Full details and conversion tables here: What is a troy ounce? 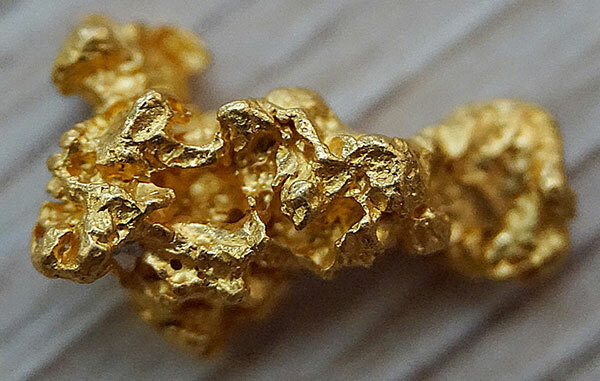 Gold Nuggets Or Fool’s Gold? Observe also the hardness. Pyrite is much harder than gold and will scratch glass or a penny, whereas gold will not. (Pyrite has a hardness of around 6.0 to 6.5 (Mohs), Gold 2.5 to 3.0). a) You could easily damage your teeth on a hard substance. b) Other metals (such as lead) are also soft. c) You might be biting something that has toxicity (lead again) or is unhygenic. d) Gold nuggets may be soft, but manufactured gold items are often alloyed with other metals that are harder, rendering the alloy hard enough to damage your teeth. e) A person may not appreciate you biting into their item of gold! Sometimes you may see a rock with small golden veins or flecks in it and wonder whether it is real gold. Examine it under magnification: Gold’s “soft” rounded appearance will continue as you zoom in, whereas examining pyrite with a loupe (Amazon Link) will reveal a surface made of tiny cubes or similar polyhedral structures. 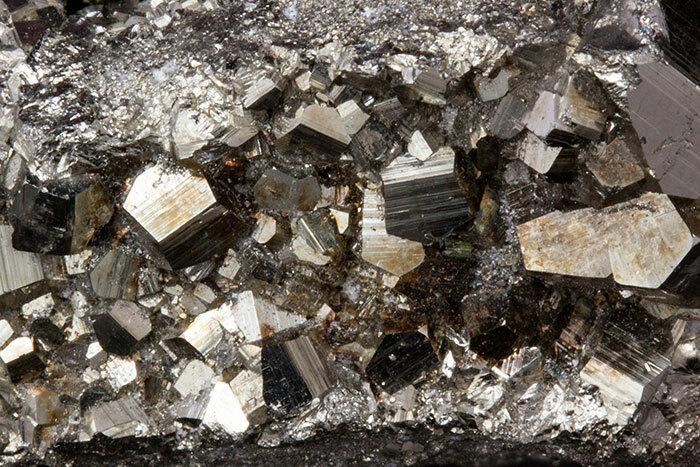 If it has sharp, straight crystalline facets it is probably pyrite – although it is possible that a nugget may contain both gold and pyrite. This final test of a gold nugget is a little drastic (and probably not recommended); you can also try hitting it with a hammer. (The solution to everything! 😉 ) Pyrite will shatter under a hammer, whereas gold is very malleable and will bend or flatten. A touchstone is a small, typically inexpensive flat block of dark colored stone – for example slate. The stone has a finely grained surface, upon which true gold will leave a visible golden mark if rubbed against it. 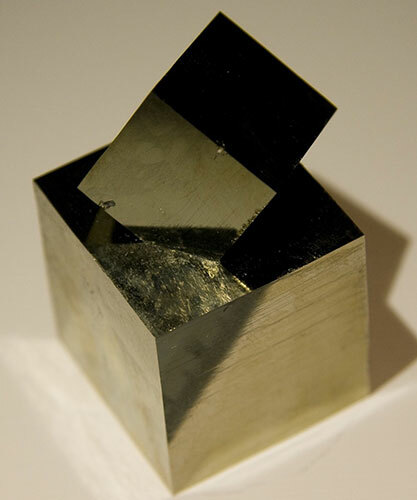 If the mark left is black, the sample is not gold but pyrite. This test can be performed at home by purchasing and using a surprisingly inexpensive kit (for example this test kit on Amazon which costs only around $15-$20.) These kits contain small bottles of chemicals and a touchstone and will identify 10k, 14k, 18k, 22k gold, plus also platinum and silver. The test works by Tdropping a drop of the acid on the streak plate on the place where the gold has been rubbed. If the mark stays the same color, the gold is pure. 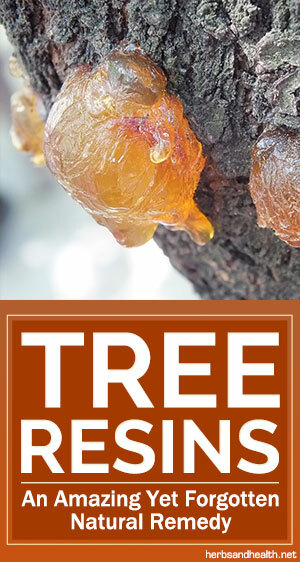 If it turns yellow-orange, the gold may be less pure. Any other color denotes another metal. 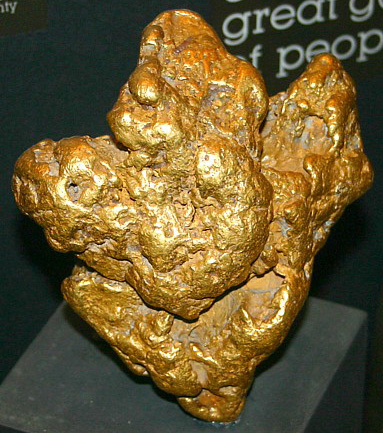 The touchstone should work well for raw gold nuggets. The modern day touchstone test kits can identify different purities of gold – however this test alone is not infallible: If the item has a thick layer of gold plate and the metal underneath is not revealed, the touchstone test will only reveal the composition of the plated surface. See the section on gold plate below. An reliable, simple version of a touchstone test, which may be performed at home to evaluate gold nuggets, uses what is known as a streak plate. (Amazon link) This is simply an unglazed piece of white porcelain tile, perhaps a tile’s back surface that is not shiny. Gold will give a golden streak on the plate, pyrite a black streak. Streak plates are also used for identifying other minerals. Note – this can damage the appearance of jewelry; use either on an inconspicuous area or on scrap gold only. To perform this test, make a scratch on the metal item using a nail file. Using a dropper, apply a very small drop of nitric acid to the metal. No reaction – gold (or false nitric acid!) Milky color – gold plated sterling silver. Green color – gold plated base metal. Important safety note – nitric acid is a hazardous substance – highly corrosive, possibly fuming and can also be explosive under certain conditions. It can also be self-igniting when brought into contact with certain chemicals. It should only be handled by someone who has the requisite experience and lab safety equipment. I am not sure whether this chemical requires a license to handle these days in all locations, so please check. This is the most accurate of all the tests for gold. It is however destructive of the object being used (though the gold used is recoverable) so cannot be used for jewellery, rare coins or objets d’art. It is the method used internationally by the gold mining and refining companies and can ascertain the purity of gold ore. It is also used to assay gold bullion and when properly performed can have an astonishing accuracy – up to 1 part in 10,000. The method used for fire assay is old in essence and it is fascinating to learn that it remains relatively unchanged since ancient times. In modern times the method differs only in detail from methods delineated by Agricola in his famous 1556 metallurgical treatise De Re Metallica. 1) Look at the sale price of the item. If it is less than the current price per troy ounce of gold, it is almost certainly not solid gold. FAKE! This bar is gold plated only! 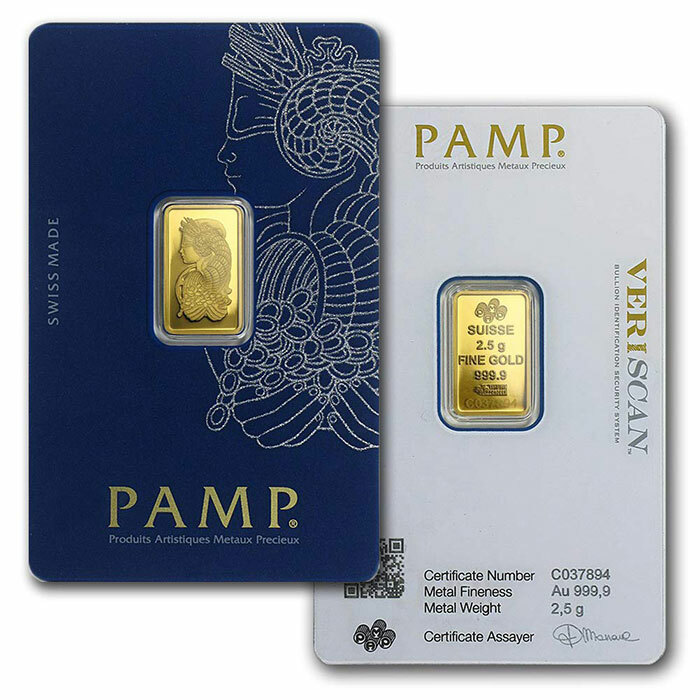 See how it is intentionally designed to look like a genuine gold bullion bar, even to the point of being seen cased in plastic – and also weighing one troy ounce. But the wording gives it away. It is plated in 999 pure gold, to a depth of “100 mills” thickness (whatever that actually means, which is questionable). Note that these are borderline legal to sell, with the seller counting on the “100 Mills” wording which indicates that they are not solid gold. But the buyer must know what this means! These items are novelties, not bullion, and are essentially worthless. If you see the markings RGP (“Rolled Gold Plate”), Clad, Filled, Layered. GE, HGE, H.G.E., GF, or 1 /10 , 1 /20 , or 1 /30 then it is gold plate. Also if you see anything with “100 Mils”, “100 Mills” or “5 Microns” on it, on either the item or the sales description, this is a description of the plating and means that the item is plated or clad to that depth. The core is either silver, brass or some other cheap metal. Similarly, if you see the words “Gold Clad”, “Layered Gold” or (obviously) “Gold Plated” in the description, then the item is not solid gold. Beware however of the mark “KP” – for example 14KP – it does not mean “14 Karat plated”, but means “14 Karat Plumb”, which means “14 Karat exactly, no more, no less – the item is (claimed to be) solid gold. 3) Look for areas where the gold plate may have worn off, such as prominent edges or clasps. If jewelry is old and has seen much use, it will have had some wear and gold, being a soft metal, can wear down over time simply through friction. If another colored metal shows through in a prominent place, the item is plated. 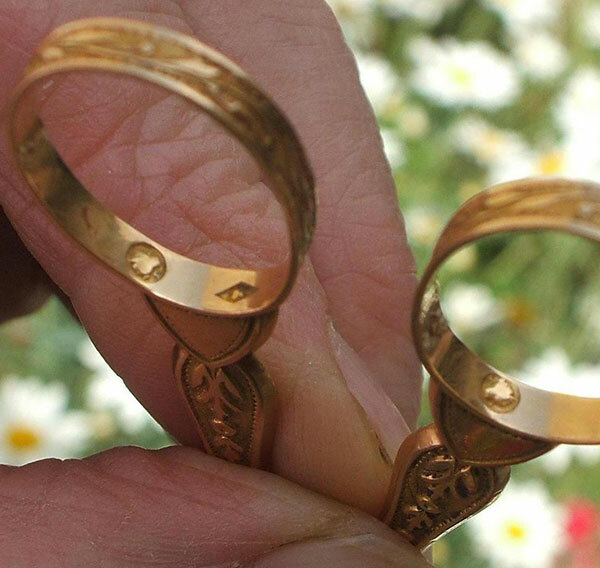 Green or black corroded spots will also indicate the presence of other metals underneath: Pure gold does not tarnish in these colors but stays gold-colored. 4) Run a magnet over the gold. If the item contains iron or nickel, it will be attracted to the magnet, whereas pure gold and many other metals will not. So while this test may be useful in sifting out some fakes, “just because it passes the magnet test, doesn’t mean it is pure gold”. 5) Finally, if needed, apply the density test as outlined above. Bisht, R. S. (1982). “Excavations at Banawali: 1974-77”. In Possehl, Gregory L. (ed.). Harappan Civilization: A Contemporary Perspective. New Delhi: Oxford and IBH Publishing Co.. pp. 113–124. Survival gear doesn’t always have to be expensive or hard to find. 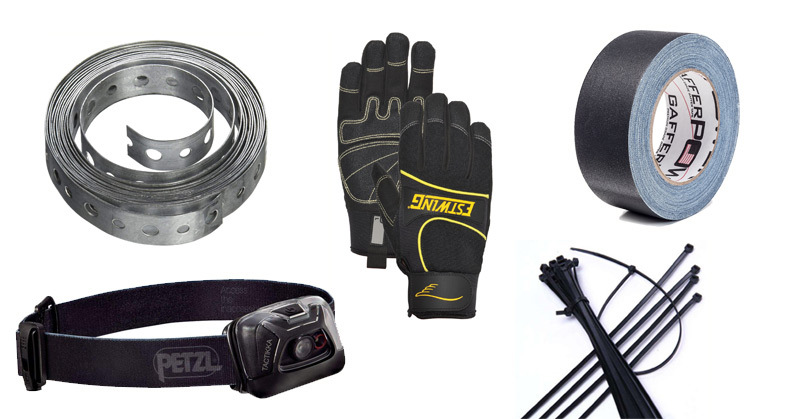 Here are 10 inexpensive “hardware store” basics that are an absolute must for preppers! A survival kit essential with countless uses. 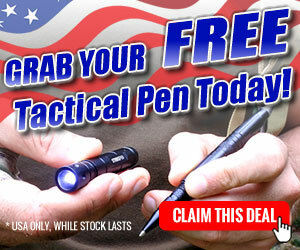 It’s also very lightweight, meaning that you can carry a good length with almost zero effort. Here’s a 100-foot 550 paracord we found on Amazon for under $10. Great reviews and tons of colors available. Another item that goes with me everywhere. A headlamp enables you to work in the dark, where a regular flashlight leaves you either one-handed, or attempting to balance the flashlight in some precarious way, where it (of course) falls and plunges you into darkness at the vital moment. The Petzl Tactikka is a great choice. My current headlamp is by This one by Northbound Train and I am absolutely happy with it. Cheaper than a Petzl and their customer service was impressive. The old joke is that duct tape holds the universe together; however event production, television and film professionals will choose cloth-backed gaffer tape over plastic-backed duct tape every time. Being cloth-backed, it is ultra-flexible, strong and easy to tear off a strip to the size you want. If you get the standard 2″ wide rolls, you can also tear the tape lengthways to make long, thin strips and make your roll go further. Gaffer tape is also longer lasting than duct tape, generally peels off with less residue and makes a stronger, more secure bond. I keep rolls of this Real Premium Grade Gaffer Tape By GafferPower Made in the USA in my car and in my survival kits at all times – and wouldn’t be without it. These of course hardly need an introduction, as almost everyone in the world is familiar with them. One of the great advantages they have is their rapidity of use and the variability they have – you can hold things tightly, or you can make a larger loop that is also strong. Zip ties are also super cheap. You can get a pack such as this 500-Pack of Self-Locking 4+6+8+10+12-Inch Width 0.16inch Nylon Cable Ties for just over 10 bucks on Amazon. Another item you will never catch me without. Proper work gloves are the difference between tearing through a project and tearing through your hands. They are an absolute essential – not only for safety, but will increase your productivity when doing rugged work. I tend destroy gloves and boots fast because I have this tendency to go at what I am working on like a tiger. The result of this is that I have personally abuse-tested most of the work gloves out there. There are numerous great brands – so find the ones that work best for you and then buy a stash of several pairs so that you can replace when needed. You want something that has great grip, flexibility, durability and protection. They should have super-tuff pads on the fingers that wood splinters and so on will not go through. If you find that you still get splinters and cuts despite wearing gloves… you need tougher gloves. Wells Lamont Synthetic Leather Work Gloves. Dead On DO-803XL Python Anti-Vibe Glove. Estwing EST7790XXL Premium Multi-Purpose Work Glove With Cut-Resistant Aramid Stitching Synthetic Leather Re-Reinforced Palm. Also worth checking out are the cheap pigskin gloves but they are more cumbersome, meaning you have to take them off and put them back on more times during the day when doing something detailed. Great for concrete work because that destroys gloves faster than anything else I can think of. Love this stuff. An incredibly useful quick-fix item. Together with screws / small nuts and bolts, you can use Metal Hanger Strap to ‘earthquake strap’ so many different things, and as a quick-but-super-strong construction material. I have also found the Perforated Nylon Pipe Strap to be incredibly useful. Simple, cheap, strong and with so many possibilities. Always have a roll of this on hand in your survival kit and especially in your car kit. For example I’ve used this to secure a broken fender that was hanging loose after a minor fender-bender and make it home without having to get a tow! We’ve found rebar wire on Amazon – but you will probably want to buy this item at your local hardware store as a roll weighs a few pounds. Make sure you have a good pair of Linesman’s Pliers on hand for perfect twists and easy cutting. A reusable respirator such as this 3M Half-Face Respirator is a survival kit essential as well as a work safety essential. Note that to be fully up to code you should use the exact mask and cartridge that is rated for the work you are doing. But for general purpose, these will solve the problem of numerous types of toxic fume and airborne particulate. Having one of these respirators saved my lungs during the California wildfires. This is the 21st century, and your primary goal is to survive, not to look like a modern primitive. So let the others sit there shivering, rubbing sticks together and try to get some smoke going. Keep a pack of Bic lighters on hand: You’ve got flame when you need it and you can be sipping your hot chocolate asap. 🙂 Sometimes the most awesome pieces of gear are the most simple. Here’s a 12-pack of Bic Lighters on Amazon that work out at just over a dollar each. Another reason these are great for survival kits is that they are good for many years. I was going through some stuff that had been in storage over 15 years and found one of these lighters. It sparked and lit up first time. Gotta love that. An item that doesn’t look like it should be on this list, but believe me, one of these makes an incredible difference to your ability to work in rough, cramped spaces, such as kneeling on rough ground or crawling or laying on your side in a tight crawl space. The kind of thing you didn’t think you needed until you have one and then don’t want to be without it. I found this 5050 Ergo Kneel Handy Mat II to be much more versatile than regular knee pads. The world agrees with me: It scored 94% 5-star reviews, the other 6% were 4 star. That’s an extremely high score on Amazon. That’s it for your next hardware store survival run! 🙂 What else do you think we should add to the list? Let us know in the comments! While most people in the Western world are completely reliant on large corporate agribusiness enterprises, many Russians feed themselves by growing vegetables and fruits in dacha gardens, which supply an astonishing 40% of the country’s food. Russia is an industrialized country that is larger than the U.S. but grows about half of its total food production in home gardens in a difficult and short-season climate. These dacha gardens are proof of the viability of small-scale sustainable agriculture as a genuine alternative to the highly criticized industrial farming model. Dacha gardening has been feeding the people of Russia for a millennium. It started as mainly subsistence or survival gardening and has evolved into a self-provisioning model between the Bolshevik Revolution and World War II. One-third of the Russian population owns a dacha. There are about one million dachas in the Moscow region alone. A typical dacha has a garden plot with a cabin. With a size of 600 square meters or 0.15 acres, dachas were originally intended as recreation getaways of city dwellers and as small gardens for food. Some dacha plots are over 1,200 to 1,500 square meters, but no property exceeds 2.4 acres or almost one hectare. Growing one’s own food supplies is a habit that has fed the Russian nation for centuries. Russians pride themselves on the desire to grow their own food. This passion has contributed immensely to the sustainability of Russian agriculture. Despite the mass urbanization and industrialization of the past century, many Russians still migrate to their rural kitchen gardens to grow and harvest fruits and vegetables. The most common dacha fruits and vegetables in cool temperate regions of Russia include apple, blackcurrant, gooseberry, strawberry, plum, pear, grape, potato, cucumber, zucchini, pumpkin, tomato, carrot, cauliflower, radish, turnip, onion, garlic, and parsley. According to 2011 data from the Russian Statistics Service, dacha gardens produced over 80% of the country’s fruits and berries, over 66% of the vegetables, and almost 80% of the potatoes. Dacha communities also supplied 50% of the nation’s milk, much of it consumed raw. These figures could be higher as they didn’t take into account the self-provisioning efforts of wild harvesting or foraging of wild-growing plants, berries, nuts, and mushrooms. Dacha gardening or self-provisioning gardening played an important role in the early 1990s after the collapse of the Soviet bloc. When the heavily subsidized commercial agriculture collapsed with the demise of the USSR, dacha gardens survived and were the main reason why the Russian people did not experience a famine during the period. To put this in modern parlance, the distributed architecture of their farming system made it robust. Key to the success of the Russian mindset is the sharing of surplus food. Dacha communities would share their excess food out of sense of abundance or plenty. This system of sharing resulted in a resilient food network that is sustainable. Another important aspect of this system is seed saving. Check out our giant database of heirloom seed suppliers. Russian household agriculture can claim itself as the most extensive system of successful food production of any industrial nation. Dacha gardening shows the possibility of highly centralized, small-scale food production.